Honestly, I can’t tell you what I did when I turned twenty-one. I don’t remember where I was or how I celebrated when I reached thirty. For whatever deep-seated reason those years don’t appear in my conscious memory, I can’t conjure them up voluntarily, even though for me thirty was only five years ago and twenty-one fell in the crucial year of millennial reckoning, 2001. As it happens, the only years I can remember vividly are the years I celebrated with cake. My birthday is February 18th, 1980. I’m an Aquarian on the cusp with Pisces. There are probably celestial reasons why I can’t remember my birthdays unless they involve cake. In the stories I tell myself my mum is not a baker, but now that I look back there is a decade worth of childhood birthday cakes proving that she was. She baked a magnificent Teddy bear cake in 1983, for instance. The body was formed from two conjoined round sponge cakes covered in white icing with black Smarties eyes and nose, a red Smartiesmouth, and two cupcake-sized iced ears. My older cousins James, Jim and Kate sung Happy Birthday while I leaned forward to blow out the candles. The food of celebration, the cake, the cream puffs and the sense of family all rattle around loudly in my memories now. Mum produced another miracle cake when I turned seven. In photos I’m wearing a white t-shirt and a pink skirt. My hands are held up to my chin with excitement; I know I’m giggling even though my head is cut out of the frame. Behind me, on a table, on a tray wrapped in pink tissue paper is the figure seven constructed from a double layered butter cake in-filled with jam. I know it’s butter cake and that it’s jam filled, but from the outside you would not be able to tell. The whole thing is smothered in great lashings of pink icing and decorated with Lifesavers clustered together to form flowers. Yes, the decorations were pink. Yes, it was a phase I was going through. I’ve been to Pastelería Ideal on Calle 16 de Septiembre, so I know how cakes are done in Mexico City. My boy-friend Ernesto celebrated his birth- days with outrageous, over-sized clown cakes, one after the other, from the first opportunity. 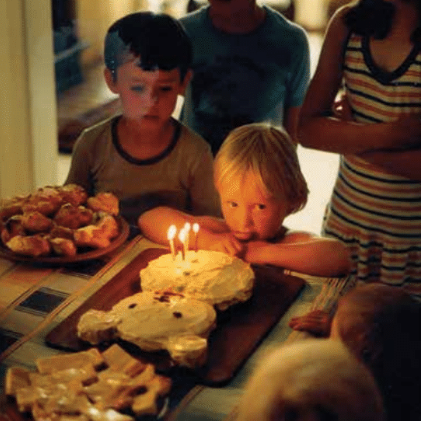 In Australia, our birthday cakes were homemade, humbler, but no less cultish. Most of the kids from my generation lusted after cakes from the bible of celebration: The Australian Women’s Weekly Children’s Birthday Cake Book, by Maryanne Blacker and Pamela Clark. The book showcased 107 different cakes, all designed to commemorate important milestones in the lives of Australian kids. It was published in 1980, the same year I was born, and was the type of book you picked up from a newsagent rather than a fully-fledged bookshop. The recommended retail price was $4.98. Most houses had a copy, or borrowed one a few weeks before birthdays. It has been called: “the best book ever written in this country”. For the number of lives it has touched, that seems a fair enough judgment. Year by year we would plan and plot, a vast number of us, curled up on sofas across Australia with our well loved, dog-eared Children’s Birthday Cake Book, homework discarded. We asked for pirate cakes with eye patches formed from halved chocolate biscuits, a chocolate coin or a ring jube substituted for an earring. We chose candy castles with turrets of inverted ice cream cones. We longed for guitars, good witches, Leonard the lion, and a rubbe –which controversially mixed popcorn and potato chips in with the sugared egg white frosting. I remember the book with the same reverence you might remember high art or literature. Choosing a birthday cake from its pages is the first memory I have of exercising free will. My parents were both incredibly generous with what they allowed me from the book, considering mum was otherwise a staunch bohemian, and dad an anarchist. Next to the heart-shaped ice cream cake that heralded my eighth birthday were some of mum’s health-focused fingerprints: trays of triangular water-melon slices, whole strawberries, and summer cherries. They were OK because they fitted in with my pink colour scheme, which did not stop at age seven and continued well into age eight. The candles for this cake were whisper thin and long-legged; looking back, they resembled eight flaming darts all aimed at the bullseye of a heart. We sang Happy Birthday, sank a knife into the melting mass, and handed out pieces to my gathered school friends. The ice cream cake was the one I craved above all others. I did not need Dolly Varden, with its small doll’s body emerging from a skirt of deep mauve and white piped icing. I did not want the sewing basket, the sewing machine or the stove from the chapter dedicated to girls. I wanted bears, sevens, ice cream hearts, and my mum and dad standing behind me, ushering me on to blow out the candles. I hoped to extinguish them all at once, in one fell puff, to avoid the rumoured threat of a boyfriend or more. If there is one unfulfilled wish from those days, it is the swimming pool cake: a hollowed out, round butter cake filled with lime jelly and surrounded by a fence of Arnott’s Tee Vee Snacks Malt Sticks. I saw it as my future: summer holidays spent like those small plastic figures, with their jube flotation rings, green sprinkle bathing caps and jelly snake inflatable day beds. The paper cocktail umbrella, which protected them from the sun, represented for me everything exotic in the world back then. The ingredients for Children’s Birthday Cake Book cakes were not hard to find or particularly expensive. In fact, the authors recommended packet mix for the butter cake bases. If any daring mum or dad wanted to go at it alone, they suggested a simple recipe of 125g of butter, half a teaspoon of vanilla, half a cup of castor sugar, two eggs, one and a half cups of self-raising flour, and one third of a cup of milk, mixed and cooked at 180ºC. Icing was always Vienna cream and fluffy frosting (lightened with two or three egg whites). Honestly, I don’t remember if mum used packet mix or preferred the DIY recipe. I only remember the cakes and the sense of family they embodied. It would have impressed me at the time had mum made my cakes from a packet; it would impress me now if she concocted them on her own, and this certainly is more in keeping with her character. I told you, at the start, the story I tell myself: that my mum is not a baker, that I am a self-taught cook. But the story I tell myself is fiction, something I’ve created as a convenience over the years. 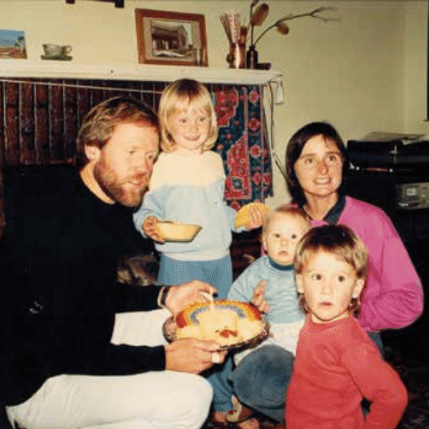 My mum baked a magnificent echidna-shaped cake in 1985, but it didn’t coincide with one of my birthdays. This was just for us, to celebrate life, an ‘anyway cake’, as she called it. Recently I tried finding it in the pages of the Children’s Birthday Cake Book, but couldn’t find it there. The echidna cake mum designed herself. I remember I sat on a bale of hay, in the backyard of our rented home in Kangaroo Island, and held it like a prize and smiled and smiled.